Game Awards 2017 have announced the best game of this year. As many have predicted, the best game of 2017 is Legend of Zelda: Breath of the Wild. Nintendo answered by releasing the second DLC for the game, Champions’ Ballad. The new DLC will go deeper into the story of Breath of the Wild and offer some exciting new content. Yes, that includes an awesome motorcycle, because, why not? To the surprise of very few, Legend of Zelda: Breath of the Wild won the title of Best Game at the Game Awards 2017. To be sure, Nintendo’s amazing title is well-deserving of this honor. It won against some pretty tough competition. The runners-up for Best Game include Horizon Zero Dawn, Super Mario Odyssey, Persona 5, and PUBG. But, in my humble opinion, Breath of the Wild is the rightful victor. Nintendo came prepared, almost like they knew that Zelda BOTW was going to come out on top. At the awards show, they presented the trailer for the game’s second DLC pack, Champions’ Ballad, which you can check out below. What caught many by surprise is that it turned out to be a launch trailer. Yes, the Champions’ Ballad DLC is now live. If you own the season pass for the game, there’s a patch waiting for you to download and start playing. The trailer reveals some of the DLC content. 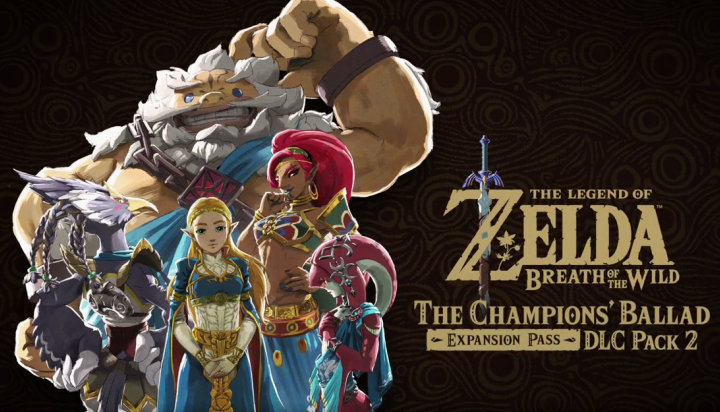 It’s going to further explore the game’s lore, especially the four Champions: Urbosa, Mipha, Revali, and Daruk. Each of them will also get their amiibo, for you collectors out there. There’ll be a new dungeon to explore, new armor, and, yes, the fabled motorcycle that you’ll be able to unlock. So, prepare yourself to dive back into the realm of Hyrule. This time, though, you’ll be roaring on your sweet new bike.